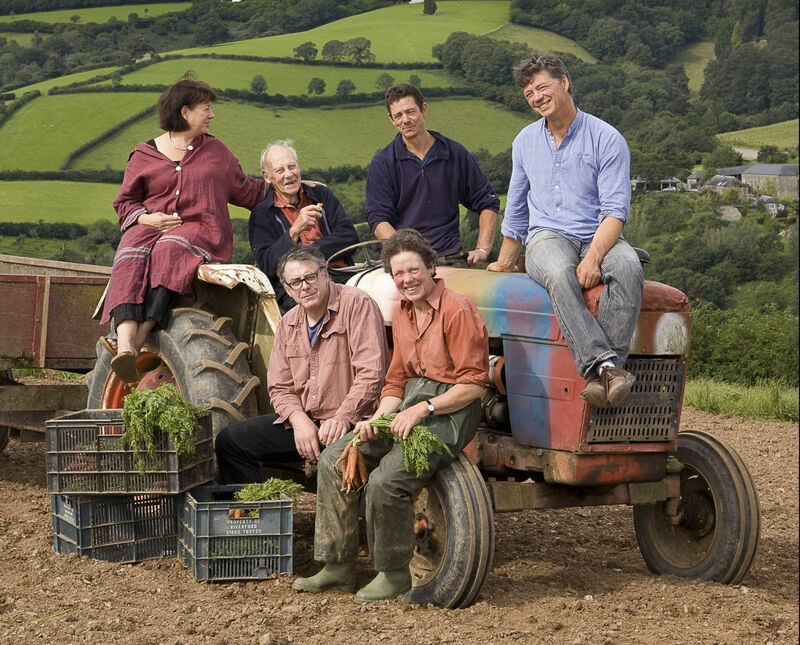 All five children, Louise (Farm), Ben (Shop), Oliver (Farm and Dairy) and Guy and Rachel (Organic Vegetable Boxes) are actively involved in the farm or its associated businesses. Thirty years ago organic, local and sustainable were unfamiliar concepts to the public. People just didn’t get it when, in 1983, Ben started making sausages and bacon from the farm's pigs. But from the beginning we have focused on high quality, good value, additive free, unadulterated and simple food production, with low food miles and a fair trade ethos. Since then nothing has changed. If something is certified organic, so much the better, but it must also satisfy other criteria. Often the magic word ‘organic’ is not enough. For example we try not to sell over-processed, production line, organic food but we do sell spanking fresh, non-organic vegetables from a grower just down the road. What we like most is to produce foods ourselves from start to finish – from farm to table, our way. Food should tell a story and, because we know what it is, we can tell you. Food from the farm, not the factory; there is an alternative to large scale monoculture, long production lines and mega supermarkets. And it doesn’t have to cost the earth. Local estate agents told us that it wasn’t unusual for people to ask for houses nearby so we thought we had better open other shops elsewhere! Hence you will find us on the high street in Totnes, at Ben’s Wine and Tapas, at our shop at Yealmpton (six miles east of Plymouth) and at 57 Magdalen Road in Exeter. “Simple but amazingly good’ – now it’s official. Old favourites, Homity Pies and Pasties scoop prizes at the 2012 Soil Association Organic Foods Awards. It’s great to be recognized for two of our real core products we make by the thousand every week” and then, guess what? The homity pies did it again in 2013, as did three of our soups, our treacle tart and Seville orange marmalade. These days, most of our food comes from factory production lines. It’s more Ford ‘Model T’ than food as our grandparents knew it. Our production kitchen is just that – a kitchen. Anyone with the most basic knowledge of cooking would recognise everything that’s going on. They should do because it’s just what they’d do at home – on a larger scale. The kitchen moved from the back of the shop a few years ago. Now we are just over the hill at Hole Farm with Riverford Organic Dairy. 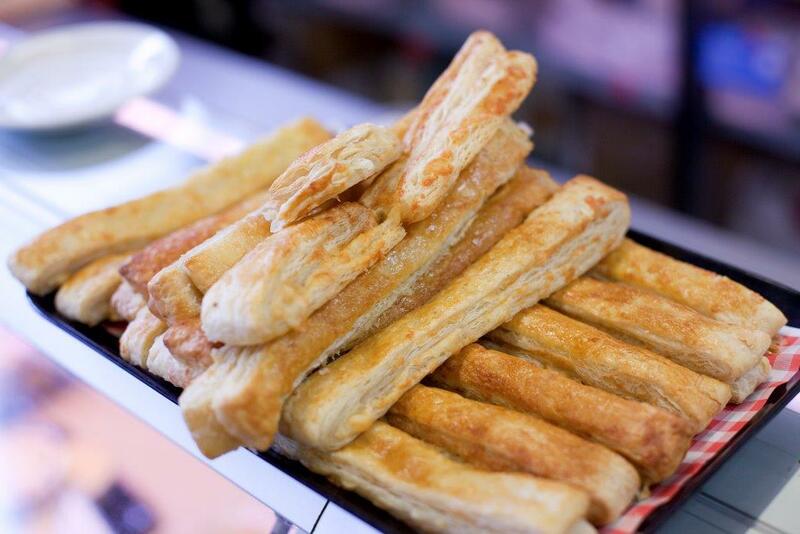 As well as the above mentioned pies, soups and marmalade, we make an impressive range of pasties, preserves, cooked meats, cakes and tray bakes, dips and fresh and frozen ready meals. Most of the ingredients are organic, as many as possible are from the farm and, most importantly, they’re all easily recognised. Ben first made English charcuterie from the pigs on Riverford farm back in the 1980s, and not surprisingly the butchery is still at the heart of the farm shop business. 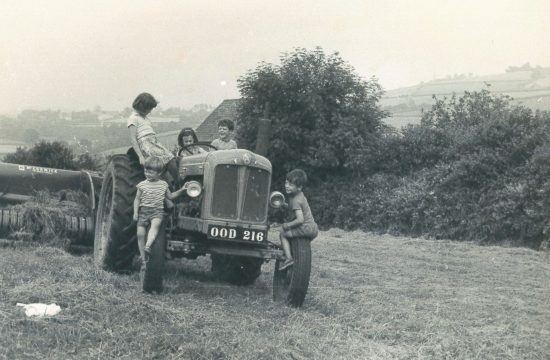 Diets have changed and ‘meat and two veg’ has become ‘ten veg and a bit of meat’ but meat still has an important part to play, both in the kitchen and as part of mixed farming systems. We keep up with the times, both in butchery techniques and cuts, cooking suggestions and how we source our meat. All our meat is sourced locally, GM and additive free and free range, from a small group of farmers we trust and have dealt with for years. They all farm within an hours’ drive of the abattoir. Beef, lamb, mutton, rose veal and venison are organic and grass fed. – so it’s good for you (higher omega 3 fatty acids) and good for the environment (less imported grain and soya and a lower carbon footprint). It’s good for local farmers too. We offer both organic and additive free free-range chickens and pork. Traditional butchers. Home delivery/mail order shopping might be all the rage and supermarkets have tried everything under the sun but, for service and quality, there is something special about a traditional butchers counter. 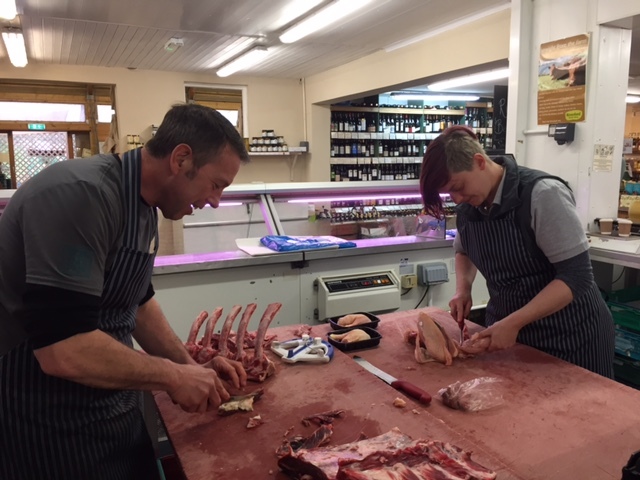 Our butchers keep well stocked meat counters at the Staverton, Yealmpton and Exeter stores while Totnes keeps a fridge full of pre-packed meat from the butchery. If there’s anything you’d especially like, like a boned and butterflied leg of lamb, then a helpful butcher will be willing and able to prepare it for you. You’ll not only find fabulous cuts of properly hung and aged organic beef and yellow skinned organic chickens but also game in season and hams and gammons cured and smoked to perfection. We don’t stop at traditional meat cuts. There are also our own meatballs, sausages, black pudding, burgers, kebabs, bacon and gammon. Everything is made from scratch, rather than a packet, from the best, fresh ingredients. We’re also endlessly looking for ideas and working on new things like stocks and broths, salamis and salumis (cured whole muscles), natural cure bacon, meatballs etc. Proper dry cured bacon. Our free range bacon is cured in draining trays, turned and rubbed with salt every other day and spends a fortnight curing and a week hanging. Our smoked bacon is properly smoked for at least twelve hours over oak shavings. ‘A truly great sausage’ (Jay Rayner, The Observer, 2003). Our bangers, of which we are rightly proud, are made by us with the best ingredients to produce bangers of distinction. Meat, rusk, water, fresh herbs and natural spices are the main ingredients in our sausages. We have a wide selection to suit most tastes from the simple pork sausage to a fiery Thai sausage. We even mix our own seasonings and there aren’t many butchers who can say that. We also make several gluten free sausages, including our own cooking chorizo, and a particularly good black pudding. John and Gillian Watson take on the lease of Riverford Farm from the Church Commission. Soon to be added, the tenancy of Hole and Caddaford Farms, making a total of 500 acres. Somehow, they find time to have five children; Louise, Rachel, Ben, Oliver and Guy. It had all been pretty normal so far but something was stirring. 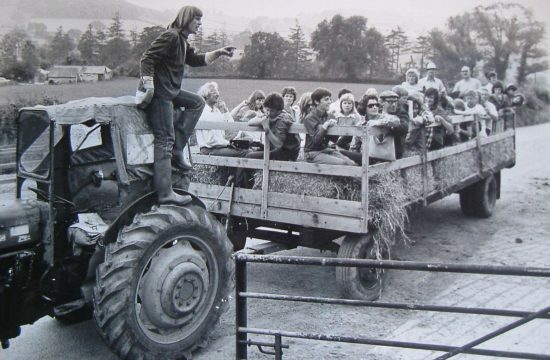 An exhibition at Totnes Comprehensive Schools Environmental Science department featured a photograph of Caddaford Farm with the caption ‘typically barren post war agricultural landscape’ or something similar. John was most upset and things started changing from that day on. His first attempt at diversification was Riverford Farm Visits; tours around the farm followed by a cream tea in the barn. Showing a load of visitors around only heightened the feeling that we weren’t doing right by either land or animals, so he began moving towards higher welfare, less intensive farming. That was before anyone was using the word organic. 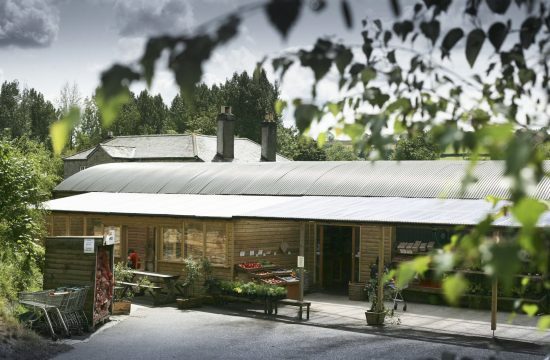 The first spin off was Ben starting the farm shop at Riverford, which opened in 1984, selling ‘English charcuterie’, made on site from the farm’s high welfare, additive free pork. Nobody else wanted to pay a realistic price for the pigs and it seemed like a long shot, but worth a go. 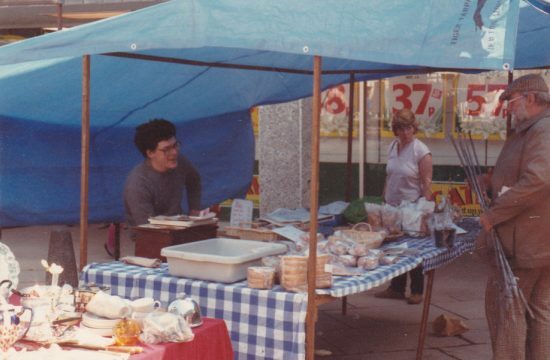 Here he is selling his wares at Totnes market where it all began. In 1986 Guy started the vegetable growing business, followed a few years later by the vegetable box home delivery scheme. In 1990 Oliver and Louise take over the farm as John and Gillian ‘retire’. 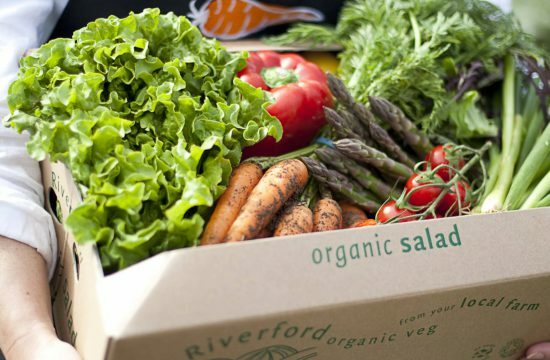 Riverford Organic Veg/Farmers move to Wash Barns – just over the hill. The Staverton shop is extended and a butchery counter is fitted. The current shop is quite different from Ben's original stall, and now features a conservatory café as well. Ben opens a second shop at Kitley, Yealmpton and introduces a cafe to expand the Farm Shop offering. 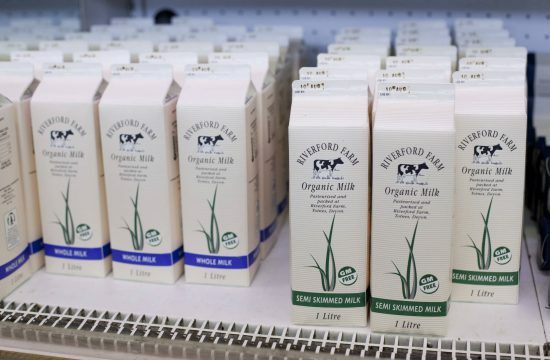 Riverford Organic Dairy opens producing organic milk, cream and yoghurt which are available through the Farm Shops. Ben opens a third shop on Totnes High Street. With so many shop customers coming out from Totnes, taking the shop to the people seemed like the right thing to do. 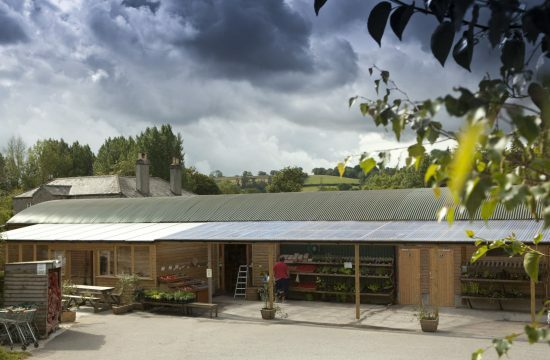 Riverford Field Kitchen opens at Wash Barn. We opened a fourth shop in Sidmouth Garden Centre. It was a disaster and closed twelve months later. Nobody can get it right all the time and we learnt a salutary lesson. 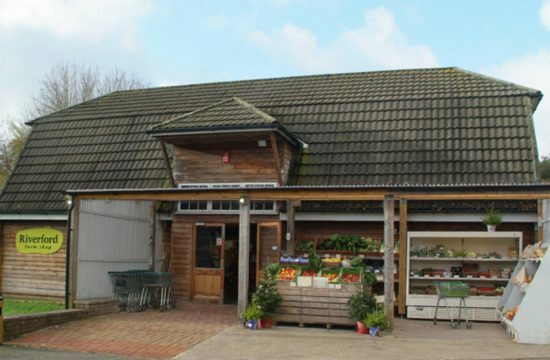 2009 saw the 25th anniversary of the Farm Shop business. 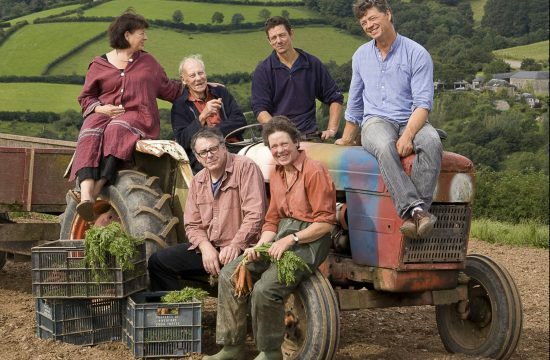 Ben took part in the celebration of the 25 year anniversary of Riverford Organic Farmers. Back Row : Rachel, John, Oliver and Guy. Front Row: Ben and Louise. 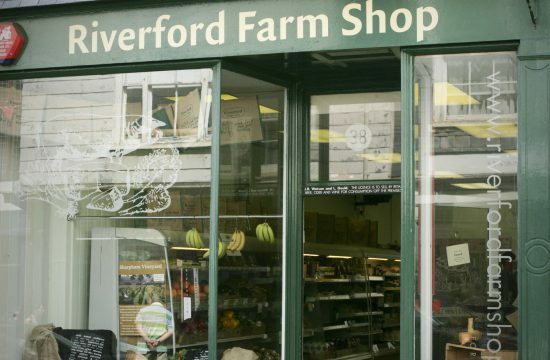 Riverford Farm Shops is thirty years old. 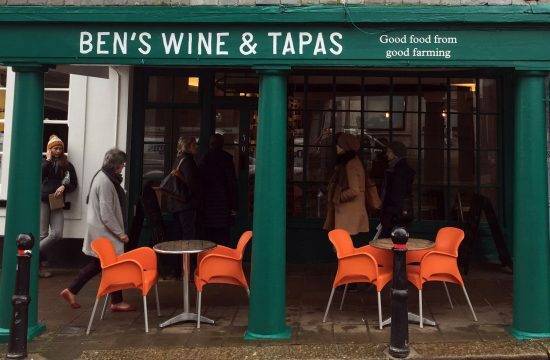 Riverford Farm Shops becomes Ben’s Farm Shops and we celebrate by opening Ben’s Wine & Tapas on Totnes High Street. 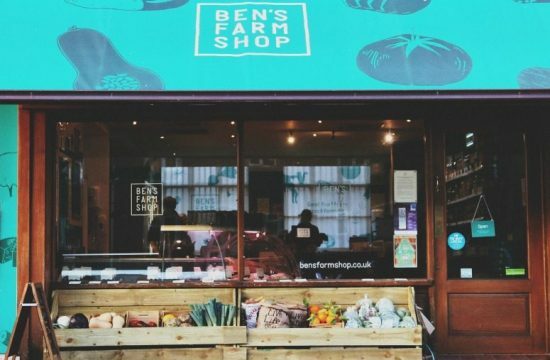 Ben opens his fourth shop, bringing the farm to the city in Magdalen Road, Exeter.